Yes, I’m thinking a lot about a set of decks that aren’t going to be available until November. I’m of two minds about this set. From a financial standpoint, I don’t think there will be a lot of immediate opportunity here. The first Commander set was put together and printed when the player base was significantly smaller, and while sealed product is at a premium, there aren’t many standalone stars. Wizards has demonstrated this past year that if the preconstructed decks are bought in disproportionate amounts, then they will print disproportionate amounts. True-Name Nemesis is the case study. It started out at $50, as befits a powerful blue creature in Legacy in a limited printing. 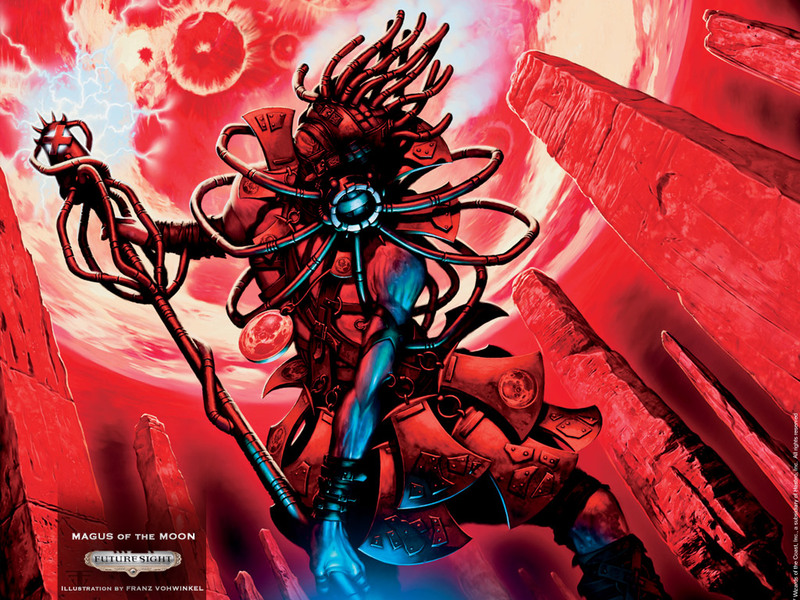 It was impacting the sale of Commander decks, as Mind Seize couldn’t stay on shelves. The company turned around and started printing and sending out two Mind Seize per case instead of just one, and the demand appears to have been met, as TNN is down to $25, a price at which it’s not cost-effective to hunt for the deck. The decks still carry a lot of value in the singles, but without the big-ticket item to immediately sell via buylist (and the rest of the deck doesn’t buylist well) things are in a reasonable state. The reprinting policy is extremely relevant to us. If one of the five mono-color decks blows up this winter, the price will not hold. There’s a chance that if True-Name Nemesis isn’t reprinted, it might creep up again (more on that in a second) but the initial demand was met through adding additional supply. Here is the behavior you’ll need to have for the five decks in November: Buy it soon, sell it fast, don’t try to make too much for too long. The decks being mono-color offers the opportunity for many reprints of cards that could use it. I would expect a combination of very old and semi-old cards to go with the brand-new ones. I think that Wizards will use these products as a way to increase supply of some cards. If these cards are reprinted, there will be a drop in value, much like with the Commander 2013 cards. In some cases, the price of a card will be unaffected by a reprint, or scarcity will keep a higher price. Hua Tuo, Honored Physician is an example. Hua Tao did not have a high price due to the ability, but the scarcity of the set. The same card in Commander 2013 is worth a dollar, and the original lost about $40 in value. In case I haven’t made it clear: I don’t think there is much long-term value to be gained by trading or buying into expensive cards that can be reprinted in the next year. The combination of MM2 in May and these Commander decks creates too much uncertainty for my taste. Better to focus speculation energy and money on Standard cards. I mentioned a few reprint candidates two weeks ago, and here are some more. If you have any of these in quantity, I strongly urge you to cash them out or trade them away. Linvala, Keeper of Silence – This angel is around $50, and is overdue for a reprint. Her ability is very relevant in keeping down the Splinter Twin decks of Modern, and is also great in dealing with the many utility abilities of Commander. This angel and Avacyn are locks in my mind to be in this set or Modern Masters 2. There’s a good chance that this deck has a tribal Angel feel, which would open up cards like Akroma, Angel of Wrath or Iona, Shield of Emeria as well. Aven Mindcensor – One of the more expensive uncommons in Modern, a fresh injection of copies would tank the price by half or more. Bloodghast – This card would work exceptionally well with the spoiled Ghoulcaller Gisa, with repeated sacrifices. I can see Gravecrawler being an easy include for the same reason. Death Baron – Gisa’s tokens are Zombies. Making them better and deadly is very strong. Nirkana Revenant – In an EDH deck with around 30 swamps, this is just ridiculous. Doubling mana is a favorite thing in casual formats, and using that mana immediately is a real beating. Phyrexian Obliterator – It increased in price twice, is more than $35, and will never be easier to cast than in a mono-black deck. Consecrated Sphinx – In a multiplayer game, this is capable of taking over. An opponent getting a copy means that two players can draw their entire deck! Kira, Great Glass-Spinner – I like the benefit and drawback to this ability. You’ll have to pay twice to equip something, or use a different ability. Spell Crumple – In case you weren’t aware, this is a $6 uncommon that was a two-of in one of the original Commander 2011 decks. A reprint will cause this price to plummet. Azusa, Lost but Seeking – Yup, she’s more than $20. Watch out, because it’ll go much, much lower when she’s printed again. Craterhoof Behemoth – A choice finisher in token or swarm decks, this seems like a for-sure include in the mono-green deck. Oracle of Mul Daya – Oracle’s price was never this high when she was in Standard. Look at what this offers, and then Courser of Kruphix. Adding life and toughness while lowering mana cost does a lot for the card! Regal Force – Oh, it feels good resolving this and drawing ten or more cards. It’s appropriately expensive. Vigor – I realize that this is a card that dies to targeted and mass removal, but it’s really awesome until it gets killed. It has a price that reflects how popular it is despite being so easy to kill. Dragonmaster Outcast – Oh, I hope this is in Khans of Tarkir block. If not, this and Kargan Dragonlord are strong candidates for the mono-red Commander deck. Magus of the Moon – A Modern card that can be its own answer (my Hallowed Fountain can now cast Lightning Bolt!) this represents a very strong ability, and a card that would go lower when reprinted. I don’t think that all of these are going to be in Commander 2014. I think there’s a good chance of them being printed in that set (or Modern Masters 2) and these are cards I don’t want to have in stock when their price tanks. Spell crumple was never a two-of. It was in a Commander product, after all!